MANILA, Philippines (5th UPDATE) – Former president Ferdinand Marcos was buried at the Libingan ng mga Bayani with full military honors past noon Friday, November 18, giving closure to his family and supporters but reopening wounds inflicted by his 21-year rule marked by human rights atrocities. Philippine National Police chief Director General Ronald dela Rosa told reporters outside the cemetery gates that 3 helicopters brought members of the Marcos family and the remains of the late dictator to the Libingan. Palace spokespersons said they did not know about the burial, which was carried out while President Rodrigo Duterte was abroad. He left Manila on Thursday to attend the Asia-Pacific Economic Cooperation Leaders’ Meeting in Peru. RJ Piniera, a media relations officer of Ilocos Norte Governor Imee Marcos, said Imee flew to Manila last night. “Kaming mga Ilocano pupunta ng Manila kasi [may] pasasalamat rally baka sakali mailibing(We Ilocanos will go to Manila because there’s a thanksgiving rally in case the burial pushes through),” Piniera said. Marcos supporters were reportedly informed about the plan but were asked to keep it confidential. The funeral rites for Marcos took place over a week after the Supreme Court, voting 9-5, ruled in favor of a hero’s burial for the former president. The petitioners against a state interment for Marcos, mostly Martial Law victims, had filed manifestations before the Court that they would file a motion for reconsideration on the ruling. SC spokesperson Theodore Te said the burial is not prohibited as the Court had already lifted the status quo ante order on it. “Like a thief in the night, the Marcos family deliberately hid the information of burying former president Marcos today from the Filipino people,” Robredo said in a statement. Barry Gutierrez, counsel for the anti-Marcos court petitioners, said the burial was illegal because of the outstanding appeals. “It’s not really surprising that this is happening. Marcos flouted the law when he was still alive, and even at his burial, he is still breaking the law,” Gutierrez told Agence France-Presse. “We are shocked and angered,” Gutierrez added. Anti-Marcos groups and others opposed to the burial, who were caught flat-footed by the surprise burial, also slammed the Marcoses for their “underhandedness” and said they would mark the day with a “Black Friday” protest. “This is a continuing deception, deviousness, abuse, and underhandedness of the Marcos family. They are just continuing the abuses and atrocities committed during the Martial Law regime,” said Albay Representative Edcel Lagman. Marcos ruled the Philippines for two decades until forced into US exile by the “People Power” revolution, a largely peaceful event that inspired democracy movements throughout Asia and around the world. Marcos, his infamously flamboyant wife Imelda, and their cronies plundered up to $10 billion from state coffers during his rule, according to government investigators and historians. Anti-corruption watchdog Transparency International in 2004 named Marcos the second most corrupt leader of all time, behind Indonesian dictator Suharto. The Philippines’ foreign debt went from $2.67 billion in 1972, when Marcos declared martial law, to $28.2 billion in 1986, according to the World Bank. After Marcos died in Hawaii in 1989, his family began a successful political comeback and tried repeatedly to have him buried at the heroes’ cemetery, where other presidents and celebrated military figures are interred. Imelda became a congresswoman and fended off all corruption charges against her. Two of her children established themselves as influential politicians. Ferdinand “Bongbong” Marcos Jr, was the more successful, becoming a senator before almost winning the vice presidency this year. 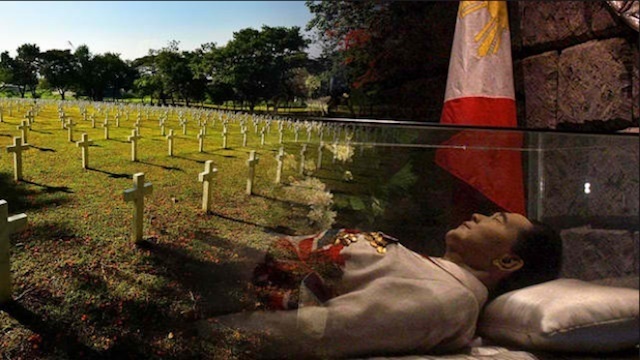 However previous presidents had refused to allow the burial in the heroes’ cemetery because of Marcos’s crimes, so the family kept the preserved body in a glass casket at his home in the northern province of Ilocos Norte. The family’s fortunes changed with the election of Duterte, a longtime ally of the Marcos family, as president in May this year. 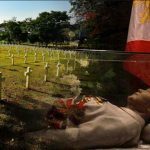 He said Marcos deserved to be buried at the heroes’ cemetery based on the fact he had been a president and a veteran of World War II.